First up . . . a hearty salad that the man will call a meal. 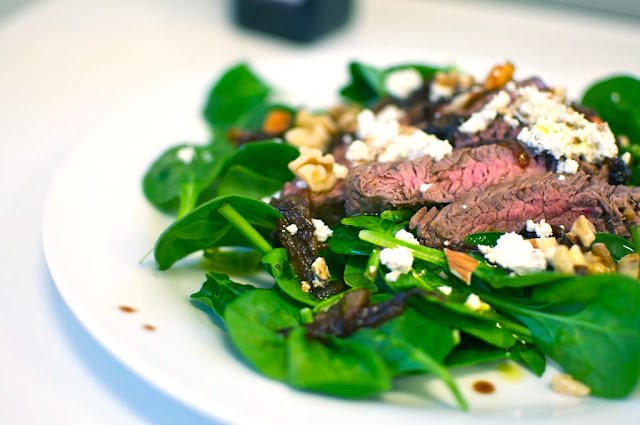 Spinach topped with flank steak, goat cheese and caramelized onions. It's not the speediest salad to throw together, but it was delicious and ready in about 40 minutes. We start by marinating the flank steak. Drop it in a medium sized bowl with olive oil, vinegar, chopped garlic and salt. Then place in the fridge for 30 minutes (or as long as you please.) I'm also learning that it is nearly impossible to take an appealing photograph of raw meat. My apologies for the photo below, but I wanted to show all the steps. While the steak is marinating, we'll caramelize the onions. Slice a raw onion length wise from root to tip, then remove the peel. Lay cut side down and then slice onions length-wise into 1/4 inch slices. 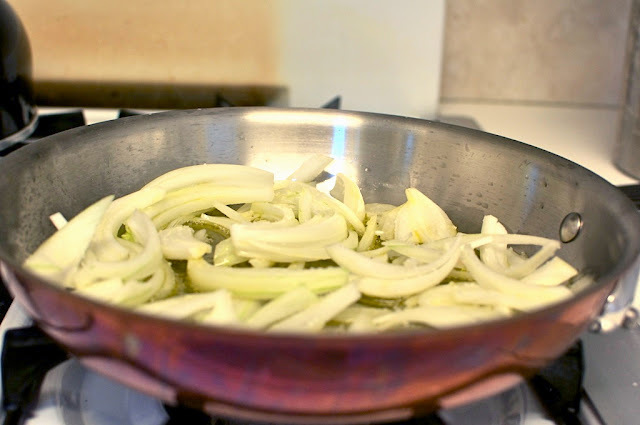 Heat olive oil a wide pan (as much surface area as possible since you want all the onions to touch the pan.) Once the oil is slightly shimmery, add the onions with a little salt. Adjust heat to medium or medium low. 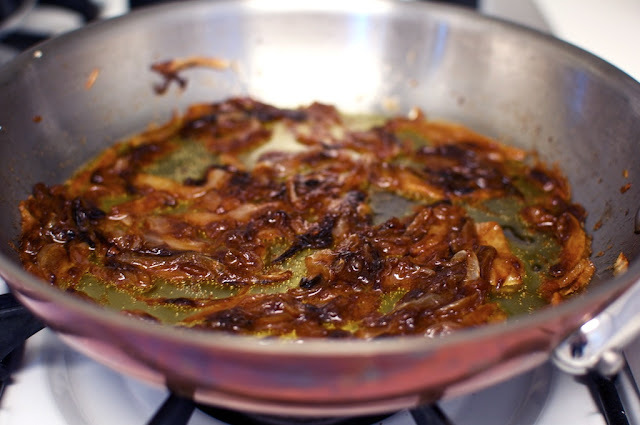 You want the onions to caramelize slowly but not char (like mine did slightly.) If they start to look dry, just add a bit of water. You will let them cook down slowly for about 30 minutes, stirring every 5 minutes or so. The onions are ready when the are a deep brown color and very, very soft. 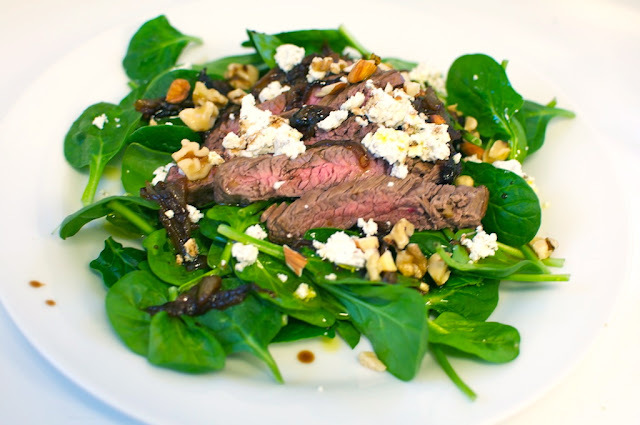 When the steak is cooked to your liking, slice it up and lay atop a bed of spinach. Add a few of those caramelized onions and a sprinkling of goat cheese, and feel free to add walnuts if you please. To finish, drizzle with a little extra virgin olive oil and balsamic vinegar and dinner is served. Enjoy! 1. 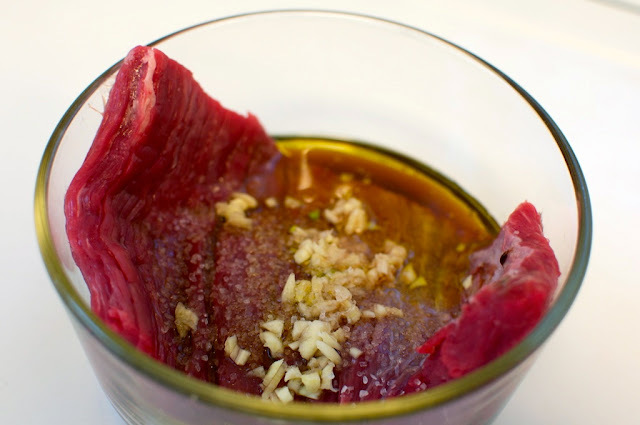 Place steak in medium sized bowl and drizzle with 1/2 cup-ish olive oil, 1 glug of balsamic vinegar, a sprinkle of salt, and the finely chopped garlic cloves. Marinate in the fridge for 30 minutes or longer. 2. Heat olive oil in wide pan over medium heat. Add onion slices and a pinch of salt and let caramelize for 30 minutes, stirring every 5 minutes or so. They are ready when they turn a deep brown color. 3. 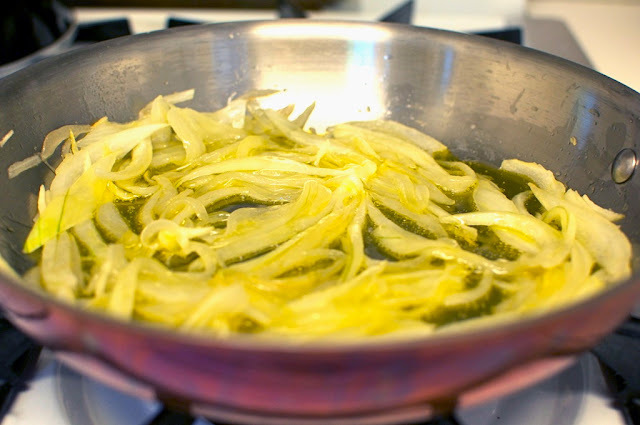 Remove onions from the pan and add a little more oil. 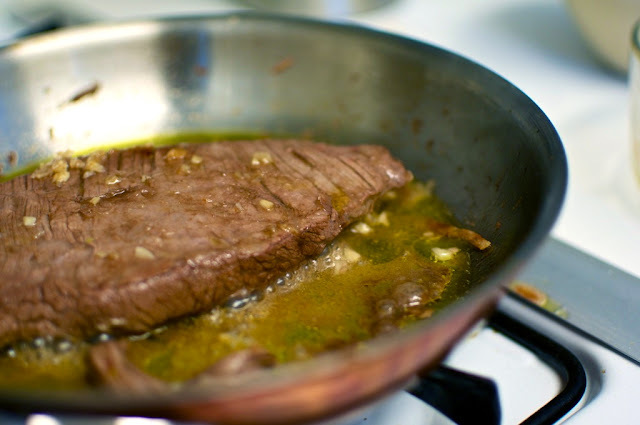 When oil sizzles if splashed with water, you are ready to cook the steak. Cook steak for about 6 minutes each side or until desired doneness. 4. 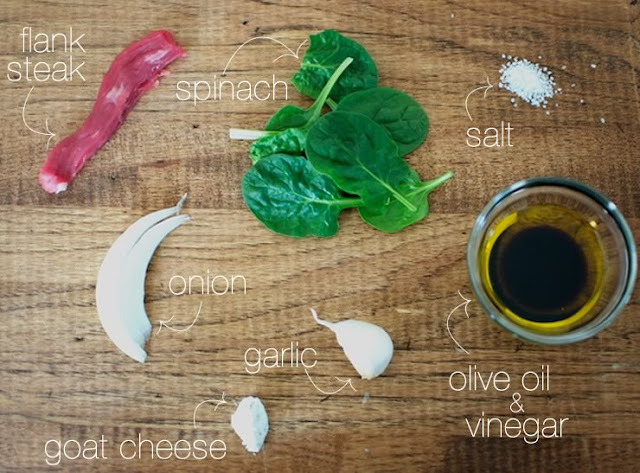 Slice steak and place a top bed of spinach with onions, sprinkles of goat cheese, walnut pieces and finished with a drizzle of extra virgin olive oil and balsamic vinegar.